Shipping your motorcycle via sea transport. What you need to know. Most motorcycle owners choose to ship their bike by ship as it is cost-effective as well as safe for international transport. In order to prepare to have your bike shipped overseas, you need to contact a professional motorcycle mover at least one month prior to the date service will be needed. This allows the company plenty of time to schedule the shipment and for you to have your paperwork in order for customs. If you are shipping from the U.S. to Europe. You can expect to pay between $750 and $1800 which includes duties, fees, and taxes from customs. The price varies dependent upon the type of transport you choose and the distance between ports. It will also vary if you need to have the bike picked up and taken to the exit port or picked up and delivered to your new location from the port of entry in the new country. Before you call a company, you need to know whether you want to ship the bike with open transport or enclosed. Roll-On Roll-Off (RORO): This is the simplest way to ship a motorcycle as well as the least expensive. Your motorcycle will be delivered to the port by you or by the company hired to ship it overseas and then it will be driven or rolled onto the cargo ship. Once on board, it is placed in a parking space and secured with straps into place for the trip. On a RORO ship, the bike will be fully exposed to the elements including sea water, weather and insects and flying animals. Containerized: For a more secure environment during overseas shipping, it may be best to have the bike shipped inside of a shipping container. Container shipping is going to cost up to 50% higher than RORO shipping but the bike is sealed inside of a large container and is very secure during shipment. When you use a container you can also pack it with personal property and household goods, although, this may delay customs clearance as it usually takes longer to fully inspect container contents during international shipping. 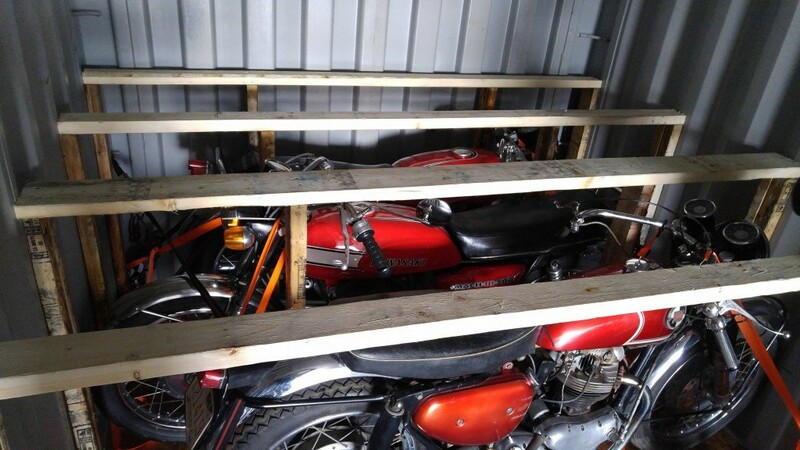 Crated: Crating a bike is the most common way that a motorcycle is shipped whether it is shipping with RORO or inside a container. Crates can be purchased through online dealers as well as may be handmade if you are crafty enough to do so or know someone who can build one for you. If the bike is crated, you will usually need to disconnect and remove the battery and drain the fluids. This will depend on the company hired and whether they require fluid or battery removal. Before the motorcycle leaves on the ship, be sure to take plenty of time/date stamped pictures and save them in a file until it is delivered overseas. You need to have this in case there is any damage or on the off chance that the motorcycle disappears during shipment. Damage and motorcycle theft occur in less than 3% of all shipments, but it is always best to be prepared with photographic evidence for filing a claim if necessary. You should speak to the shipping agent to find out of tracking is available so you can keep track of everything from your computer, tablet or mobile phone while you are away from the motorcycle. You will also want to have valid insurance coverage and your motorcycle license ready so you fully enjoy riding once the motorcycle arrives. If you have any questions, comments or need a quote contact Jason.